The backlog of federal retirement claims waiting to be processed jumped up in January, as anticipated, according to figures published Thursday by the Office of Personnel Management. The pile of incomplete claims now stands at 22,636, the highest it’s been since last February. That’s almost double the 11,669 pending applications in December. The percentage of claims processed within 60 days also fell, from a high point of 83.7 percent in December to 80.2 percent in January. The latest figures don’t come as much of a surprise. 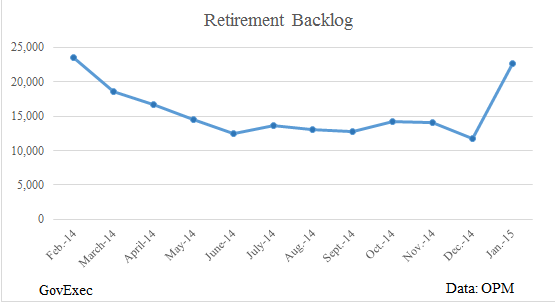 The retirement backlog usually increases at the beginning of the year, as new claims flood the system. OPM expected to receive 19,000 applications in January and received just shy of that number, with 18,629 coming in; most months it anticipates fewer than 10,000 claims. The number of pending claims is expected to start shrinking again now, but OPM still projects an inventory of 11,042 claims at the end of September. Then, across-the-board budget cuts from sequestration are scheduled to kick back in, unless Congress acts. The last round of sequestration took a toll on retirement processing, forcing OPM to abandon its goal of eliminating the backlog by summer 2013. The sluggish claims process has frustrated both federal retirees and lawmakers, who have called the wait times “unacceptable” and demanded that OPM modernize its system. 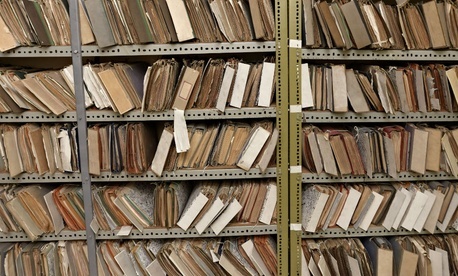 Retirees can sometimes wait several months for their applications to be completely processed. The chart below shows OPM's progress on the retirement backlog over the past year.